As a lifelong bookworm, I'm always excited to give and receive reading related gifts. A leather journal is perfect for keeping track of all the books you have read. Fingerless gloves are nice for toasty fingers while you read. A nice thick canvas bag is perfect for trips to the library. These are just a handful of the many ideas for your bookworm this holiday. Love the postcards & the bag! 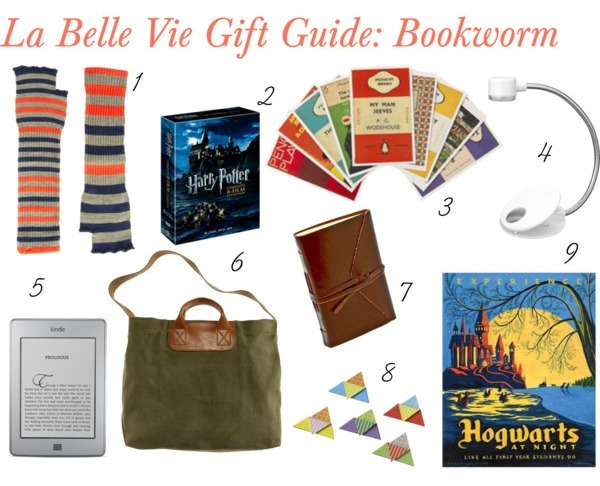 Cute gift guide for fellow book lovers. I am such a bookworm, this list is perfect for me! That bag is amazing. Love Madewell. i had tons of fashion books on my christmas list this year! I also had lots of fun playing w/ my mom's kindle over the weekend, i think it'd be a great investment!